The temple of the Emerald Buddha is the most revered temple in Thailand, it is the most famous too. It is called Wat Phra Kaeo. 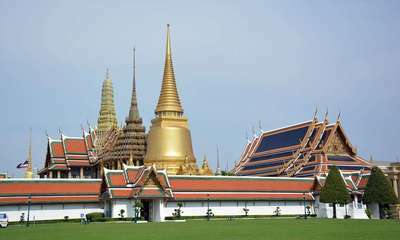 It is located in Bangkok, within the walls of the Royal Palace. Its name comes from the fact that it contains the famous Emerald Buddha, a jade statue one sixty centimeters high that has the distinction of being the most venerated idol in the country. It alone concentrates all the fervor of the people, which is to say its importance. It is a temple that can be visited, and go on site is also highly recommended so it is beautiful. Surrounded by a magnificent gallery that houses an equally magnificent fresco, the temple consists of several buildings that rival golden decorations. The principal is called ubosoth, it is he who contains the Buddha. It's a marvel of architecture, with 4-level eaves all in glazed tiles, gilded columns, mother-of-pearl doors and beautiful interior paintings. But the other buildings are not left out. The library and the Royal Pantheon, side by side, are very successful. There are stupas everywhere (cone-shaped monuments containing the ashes of a deceased person) and prangs (similar monuments of Khmer architecture) while western-inspired demons guard the entrances. Two steps away, we leave the temple to enter the gardens of the royal palace, then into its exhibition halls. Everything on site is beautiful. Decoration, attention to detail, vegetation, nothing is left out. This temple is a great success of Thai architecture, and a monument to see absolutely when you're there. The Emerald Buddha is a modest-sized sculpture of Buddha in a meditation position. His legs are bent under his body. Unlike its current name, it is not emerald but jade. He is the most revered Buddha of Thailand, he is also the best known, perhaps tied with the reclining Buddha who is 50m long and is completely covered with gold (He is 2 not at Wat Pho). Learn more about the emerald Buddha. The Temple of the Emerald Buddha is right in the center of Bangkok, within the Royal Palace. The best way to get there is to take a taxi or a touk-touk, unless you arrive from Wat Arun, the temple of dawn. In this case you just have to cross the river and as things are well done there is a ferry, just between Wat Arun and Wat Phra Kaeo. But otherwise, there is no metro stop or the airline. 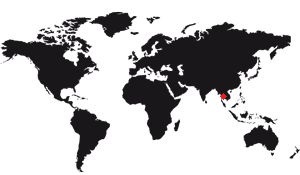 Learn more about its location, its dimensions. When talking about the history of the Temple of the Emerald Buddha, one must distinguish the temple's story from that of the statue. To put it simply, the statue was carved at the end of the 14th century and was discovered, according to popular tradition, by chance in the middle of the 15th century. Placed in the stupa of a temple of Chiang Mai, it was quickly considered sacred and therefore integrated into the royal palace. When the royalty moved to Ventiana, the statue followed and received a temple for himself alone, still in the royal palace. After more than two hundred years, the Burmese hunted the Thais from Ventian, they took refuge further south and created a new capital, Bangkok. There too, a royal palace was built and the Emerald Buddha was placed in a dedicated temple, still within the walls of this palace. He is the one we visit today (if we are a tourist) or when we pray (if we are a believer). Learn more about its history. The Temple of the Emerald Buddha is a tourist hotspot, but it is also a religious site of importance. So, first and foremost, we must respect this site for what it is: a Buddhist temple. That said, visiting the temple is definitely worth a look. Wherever you look there are wonders to detail. statues of Buddhas, demons, fantastic creatures. Gilding Frescoes. Paintings, mother-of-pearl decorations. The list is long ! To get there, it is better to take a taxi or, to make local color, a touk-touk, it's more fun. The entrance is not particularly expensive, but you will have to pay attention to your outfit. Fortunately, there are clothing rental companies, if needed. When the visit itself, it usually lasts between 2 and 3 hours, but it is not an imposed tour, you just walk around the site. So, you spend the time you want, and that's really good. Note that the visit of the temple goes with that of the royal palace since the first is in the second. Learn more about how to visit it. The temple is in fact a complex that occupies an approximately square surface of 150m side. It is delimited by a long gallery that winds around its buildings. The main building is the one that contains the famous Buddha, it's called ubosoth. It is a large building richly decorated according to the local style. Just north there is a large terrace which hosts several other buildings: A library, the royal pantheon, a chedi, two stupas (both are buildings starting at a point, rather high, that we could relate from far to the bell towers churches or mosque minarets, although the stupas or chedis have a role in preserving the ashes of a deceased person). The terrace also contains a beautiful model of Angkor Wat. 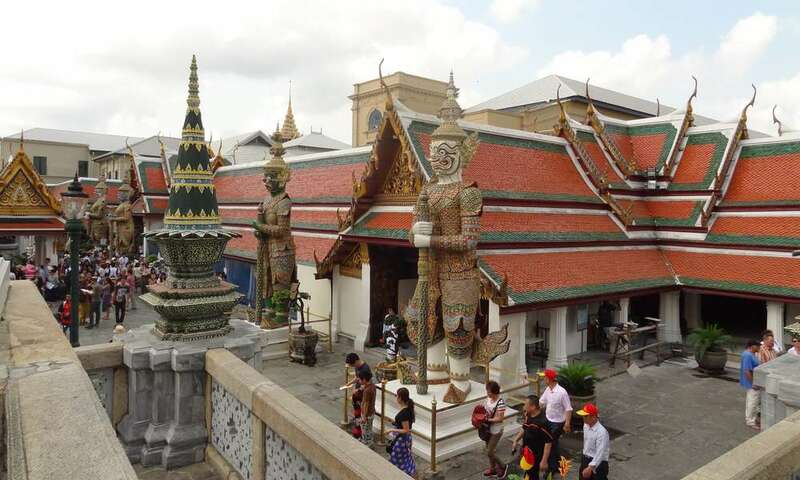 Finally, there is a host of other things to see in the temple, starting with the great gallery and the fantastic fresco telling the story of Thailand from a traditional and popular point of view. Other curiosities, there are beautiful statues of demons, guardians of the entries of the temple. And that's not all, you will still be surprised by my rich decorations, small annex buildings, terraces, etc. Learn more about its map, its description. The Temple of the Emerald Buddha is not part of the world heritage listed by UNESCO. It is quite curious, given the importance it has to the Thai people, but it is so. Want to know a little more? Read some amusing stories about Thai traditions, traditions that sometimes clash with Western knowledge. You also have many photos to illustrate the temple.